Have a Merry Christmas, Sparky! If you get a new camera for Christmas, you could post pics of those new fangled beer cans! Just to show you how convoluted (engineering term for perverted?) life can be some times - I am currently doing some CFD simulations for a company involving a new can lid design that should be to market in 9 months to a year. Who would have thought it could benefit LSR beyond the obvious fluid flow into the participants! I did some work for them two years ago regarding the adhesives that seals the cans & lids and they were able to get a patent so you are already getting CFD benefits in a very important aspect of your lives!! I will try to get permission later to show youse guys! So stay tuned! Everyone have a very Merry Christmas and Happy New Year! I have a new camera courtsey of the good Dr. G and I have learned to use it! Picts will follow when we have things to document!! Wow ---here we go ---we get to reinvent ourselves and be whomever we wish to be!! Not unless you post the pictures! WE are almost done with the Dune Buggy---we got a big scare when we created smoke but we only scorched a small ground wire before we found the culprit! Will be on the Lakester BIG TIME after the first of the year! What class does that run in? The way Sparky builds wheeled vehicles, it's probably for the 150mph club. well I spent the day making list of parts to buy and machinist things to wish for----I am sure glad that ENCO, and the like have pictures because I do not have a very deep knowledge of what most Machinist things are called, sort of like ChiCom arithmetic. I finally found out that I can buy an adapter plate so that I can mount an 8" chuck to my 10" rotaty table and I need to by a couple of # 2 Morse taper, dead centers and I can cut my splines and such with my new finds---picts to follow. Well in keeping with the new year I am going to try to honor Dr. G gift of the camera by posting more!! 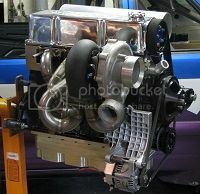 Also a picture of the new Carb we will be running. This will be our first time without EFI we will have to learn more that playing with fuel pressure to tune..might be hard for an Aggie to learn. Well in our quest for speed we may have, come up with the ultimate diet incentive just to be able to get in the car. We coped the rh side of the dr compartment tacked them, tried to get in. With roll bar padding and the 20 fire suit and inner pannels it is going to be intresting to get ALL of the necessary stuff in there---well I guess that is what beer is made for-- biengeneering and noodling this stuff out! Pictures or it did not happen!